In releases prior to Avi Vantage 17.2.3, exactly one of a GSLB service’s pools would be selected based on the value of its GslbPool.priority parameter, a value ranging from 1 to 100. Then, the value of the selected pool’s GslbPool.algorithm parameter would govern selection of a particular backing service within the pool. 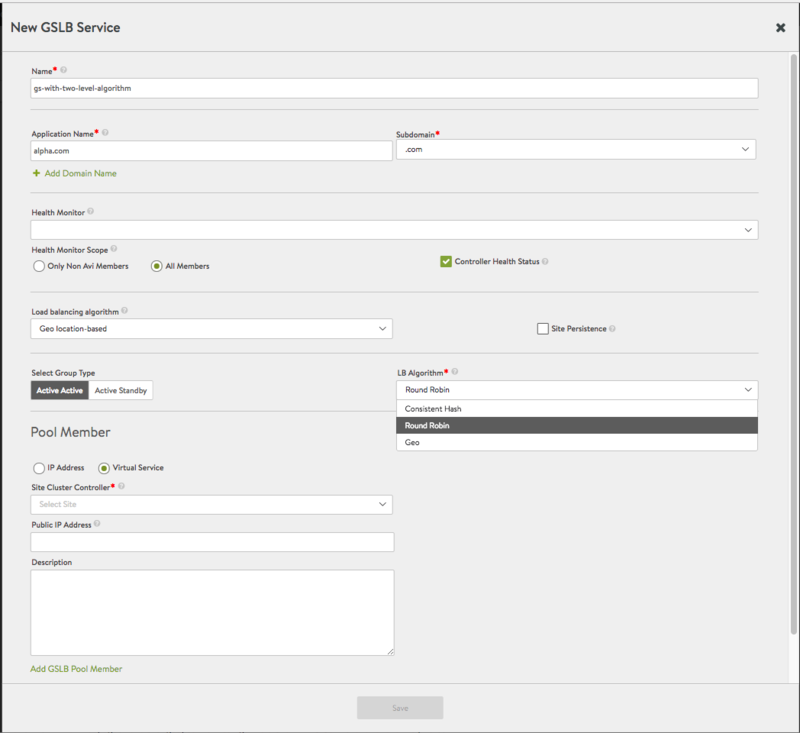 GSLB_SERVICE_ALGORITHM_PRIORITY – a GSLB pool is selected based on its pool priority; this is the only behavior defined in releases prior to 17.2.3. GSLB_SERVICE_ALGORITHM_GEO – a GSLB pool is selected based on its geolocation; this alternative is new with release 17.2.3. In the below example, pressing the TAB key prior to completing the first command reveals the two CLI options introduced with 17.2.3: gslb_service_algorithm_geo and gslb_service_algorithm_priority. Once the GSLB service object named gs2 is created, definition of its GSLB pools begins with a single pool named grp1/, whose first member is located at IP address 1.2.3.4. After the last save command, we see the fields that have been set for this bare-bones global service. Notice how the grp1 GSLB pool group has been assigned the GSLB_ALGORITHM_ROUND_ROBIN algorithm and priority = 10 by default. gslb_service_algorithm_priority   Pick the GSLB pool with the highest priority. 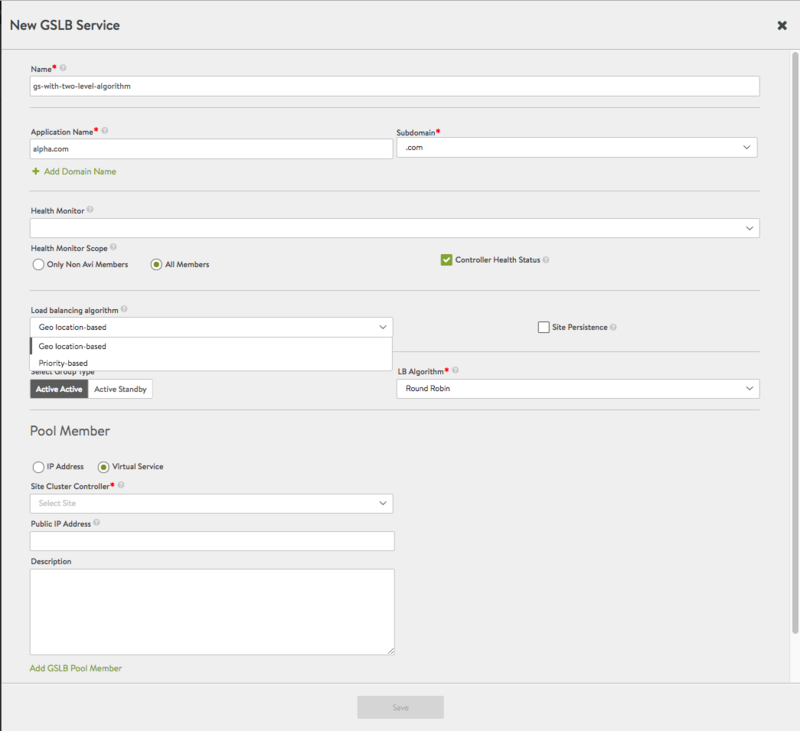 In the GSLB service editor there are two fields via which to choose the algorithms that apply at the first (service) and second (pool) levels.